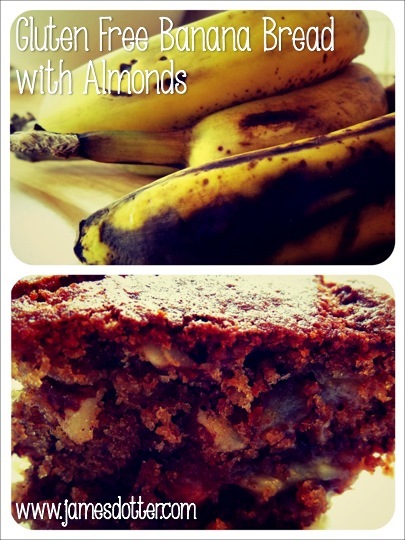 What does avoiding a pile of ripening bananas get you at the end of the week? Well, if no one eats them, it gets you a pile of mushy, gushy bananas whose last chance for salvation is a perfectly warm loaf of banana-nut bread. This recipe, adapted from Smitten Kitchen, is so delicious & easy! The bread comes out so perfectly moist – no one will know it is sans gluten. Mix in the sugar, egg, vanilla and bourbon, then the spices. Add baking soda and sea salt – continue to mix. Add Pamela’s Pancake & Baking Mix. Pour mixture into a buttered 9×13 inch loaf pan. Bake for 45 minutes to one hour, or until a tester comes out clean.